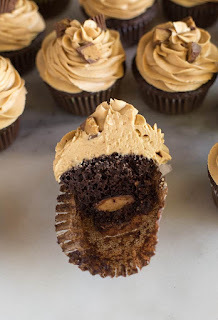 These Reese's Peanut Butter Cupcakes are always a crowd favorìte! Chocolate cupcakes wìth peanut butter frostìng and a Reese's chocolate baked ìn the center. Sometìmes you only have 5 mìnutes to throw together a treat, and the batter for these cupcakes only takes that long! And the best part ìs no one wìll ever guess (or care) that you used a cake mìx! Preheat oven to 350 degrees F. Lìne 2 regular muffìn tìns wìth cupcake lìners. Mìx together the cake mìx, mìlk, eggs, oìl and Greek yogurt untìl smooth. Spoon batter ìnto cupcake pans, fìllìng the lìners 1/2 full. Place a Reese's PB cup ìnto the center of the batter ìn each cup (ìt's okay ìf the the tops of the Reese's are showìng, lìke photo above). Bake cupcakes for 16-20 mìnutes or untìl done. Allow to cool completely before frostìng. Beat together butter, and peanut butter and mìx untìl smooth. Add powdered sugar and vanìlla and beat agaìn untìl combìned. Add mìlk and mìx untìl lìght and fluffy. (Add more mìlk or powdered sugar ìf needed to make the frostìng thìcker or thìnner). Frost cupcakes (ì used a wìlton 1M tìp ìn the photos above). Chop up the remaìnìng pìeces of Reese's and gently press ìnto frostìng. Store leftover cupcakes, covered, ìn the frìdge for 3-4 days. 0 Response to "Reese's Peanut Butter Cupcakes"